From the PR: “When India falls to her death from a bridge over a railway, her sister Poppy returns home to Brighton for the first time in years. Unconvinced by official explanations, Poppy begins her own investigation into India’s death. But the deeper she digs, the closer she comes to uncovering deeply buried secrets. Could Matthew Temple, the boyfriend she abandoned, be involved? And what of his powerful and wealthy parents, and his twin sister, Ana? Enter the mysterious and ethereal Jenny: the girl Poppy discovers after hacking into India’s laptop. What exactly is she hiding, and what did India find out about her? Returning to a hometown after years away is always a strange thing – sights are familiar but somehow the subtle differences can make the entire place feel different and you a stranger in the environs you grew up in. If you add the further sense of detachment and changed reality that comes with the death of a loved one and grief it’s not likely to make for a pleasant homecoming. A very real sense of disorientation, an unease with the familiar. 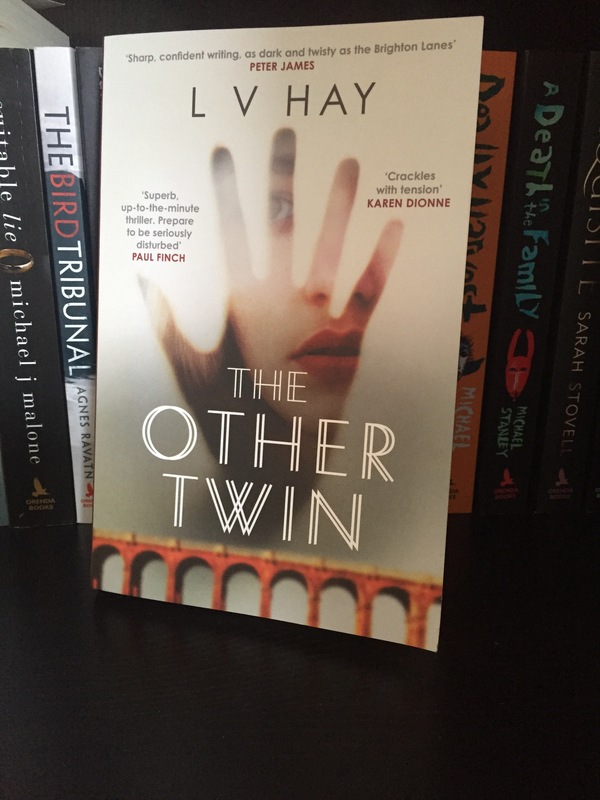 Here we are, then, with The Other Twin by L V Hay and published by Orenda Books in which Poppy finds herself called back to Brighton after nearly five years of living in London after her sister is found dead from an apparent suicide and where the sense of unease with the familiar drips from each page. Unable to believe her sister committed suicide, Poppy digs into the life of the sister that she hadn’t spoken to for over four years and uncovers a lot more besides when she begins trying to discover the meaning behind India’s blog posts. I think it’s fair to say that – as would likely be true of most of us – Poppy isn’t a great detective. Both she and the reader alike are in the dark and scrabbling for pieces and clues and looking for a foothold in the increasingly disturbing world of secrets she inadvertently seems to have stumbled into. It’s an interesting and effective technique and makes a welcome change from those too-slick-to-be-real detectives and further adds to the sense of reality. The reader is very much along for the ride. The vivid and detailed descriptions of Brighton make for an equally disorientating sensation as picturesque, seaside tourist postcards rub shoulders with some very murky and disturbing actions as the differences between perception and reality blur. Whether it’s the relatonship with her mother, that of her mother and Tim, Poppy’s relationship with Matthew and even India’s own life vs her online life… the sense of something unpleasant lurking behind the familiar, that feeling that all is ‘not quite right’, is omnipresent making for a very gripping read. L V Hay writes with a confidence atypical of many a debut novel and for all the twists and turns that Poppy’s determined digging throws out, the final reveal is very much a real surprise that had me going back through the book and wondering how I’d missed it. A very strong debut and I look forward to more from L V Hay. Thanks to Karen at Orenda for my copy and the invitation to take part in The Other Twin’s blog tour.